Many happy tears and thank-yous were shared last week as Silvia Ayala and her three children celebrated the dedication of their new Habitat home. 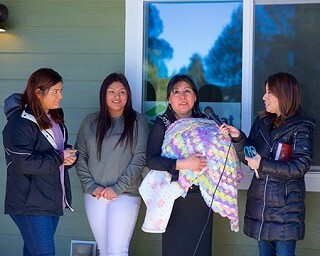 The Ayala family is the 66th family to purchase a home through Sisters Habitat for Humanity homeownership program, and this home is the second home to be built in partnership with the Heart of Oregon Corps YouthBuild. "This is one of the most important days of our lives. My mom is a single mother. She works very hard and deserves this. I am very appreciative to have my mother by my side and I am appreciative to all the people who helped make this possible," Silvia's son Jose Rojas told the volunteers and crew from Habitat and Heart of Oregon Corps YouthBuild. Thirty-five students have worked on the Ayala house since construction began 10 months ago, YouthBuild construction manager James Collins told the crowd. Heart of Oregon Corps YouthBuild is a nonprofit organization invested in inspiring and empowering change in the lives of Central Oregon youth through jobs, education, and stewardship. Their programming creates pathways out of poverty while stimulating regional economic growth. They apply a "work-earn-learn" model that invests in local young people, many of whom come from disadvantaged backgrounds, to prepare them for the workforce and to encourage their self-sufficiency. When a family is selected into the homeownership program, they are teamed with family partners. Judy Osborne and Suriana Iverson have helped Silvia through the process, and Iverson, as district community liaison for the Sisters School District, partnered and acted as a translator for Ayala. "I hope they realize what a valuable resource they have in Suriana. This wouldn't have happened without her," Osborne said. Even though Iverson was available to translate, Osborne said, "Words are important, but not really necessary. I watched Silvia's face when the walls were put up. I watched her face when we walked across the subfloor; I watched her face when the walls were being painted. No words were required to tell us how much this home means to this family." While Ayala held her new grandchild, she expressed her thanks to the crowd, saying she and her children will treasure the memories that they will make in their new home. Those interested in homeownership through Sisters habitat for Humanity or in the Sisters Habitat home repair program can visit www. sistershabitat.org and review the qualification guidelines, or call the Habitat office at 541-549-1193. Heart of Oregon Corps is currently hiring 16- to 24-year-old youth. To apply or for more information, visit www.heartoforegon.org.